That knitted caps enjoyed great popularity in eighteenth-century Spain can be seen in the many extent examples located in museums in the United States and Europe. Cooper-Hewitt has a very fine cap that was acquired in 1951 as a gift from the generous donor, Richard C. Greenleaf. Knitted in dark red silk, the cap is primarily patterned with diagonal ribs while the very top has a geometric arrangement of diamond-shapes and triangles. The dramatic tassel, at nearly twenty-three inches in length, is formed from two twisted skeins of yarn that have rings of knotted silk and tufted chenille attached. There is ample evidence showing that men and women wore knitted caps on celebratory occasions. They were an important accessory of native dress in Spain, and no artist expressed this innate “Spanishness” better than Francisco Goya (1746–1828), who painted a lively scene set alongside a river in Picnic on the Banks of the Manzanares that depicted knitted caps and other forms of Spanish dress. Fan, mid-19th century, Bequest of Sarah Cooper Hewitt, 1931-6-141. 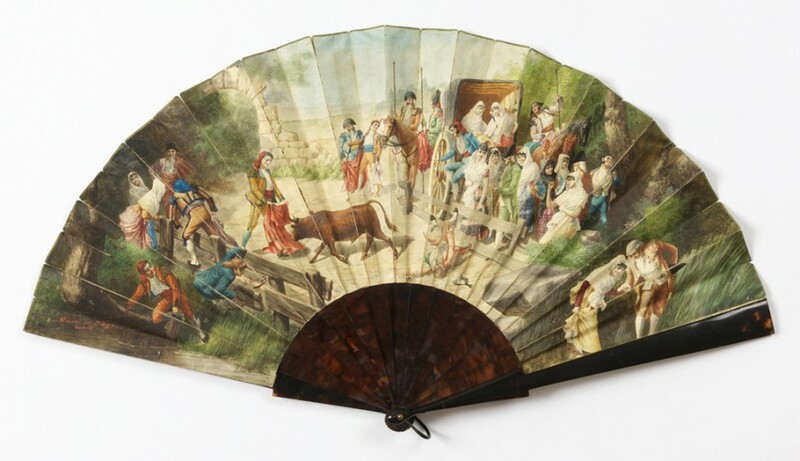 Red knitted caps also make an appearance on a Cooper-Hewitt nineteenth century painted fan showing a large group on an country excursion seemingly interrupted by a bullfight. The women wear mantillas over their colorful dresses while the men are shown in a variety of costume. The bicorne hat, breeches, waistcoat, and coat suggest French influence while Spanish costume is signified by embellished short jackets and breeches worn with sashes and red knitted caps. Most visible on the left side are the bullfighter and another man kneeling on a log by a stream. Both wear red knitted caps with elongated tassels, evidence that forms of dress from an earlier period continued to influence romantic and stereotypical images of Spanish costume and culture. Cap, late 18th century, Gift of Richard C. Greenleaf, 1951-105-35.